Dr. Haiyan Bai is a professor in the College of Community Innovation and Education at the University of Central Florida. She earned her Ph.D. in quantitative research methodology at the University of Cincinnati. Her research interests include issues that revolve around statistical/quantitative methods, specifically, propensity score methods, resampling techniques, research design, measurement, and the applications of statistical methods in educational research and behavioral sciences. Her publications include books, book chapters, articles in refereed national and international journals, and refereed international conference proceedings. She has also given lectures, talks, and many refereed professional presentations at the international/national and the regional levels and won grants from National Science Foundations (NSF) and U.S. Department of Education. Dr. Bai teaches face-to-face, fully online, and mixed mode graduate level research method, measurement, and statistical courses. She has chaired/co-chaired or served on many doctoral dissertation committees. In addition, Dr. Bai not only serves on university, college, and department committees, but she is also involved with international activities in education. Furthermore, Dr. Bai consistently provides her statistical consultation services to her colleagues and works closely with local public school districts in large-scale educational research projects. 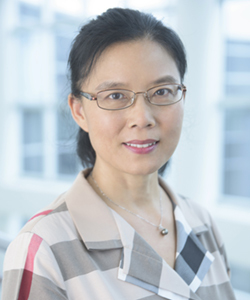 Additionally, Dr. Bai is a manuscript/proposal reviewer for refereed journals, international/national and regional conferences, publishers, and a federal/state grant reviewer. Bai, H., Aman, A., Xu, Y., Orlovskaya, N., & Zhou, M. (2016). Effects of web-based interactive modules on engineering students’ learning motivation. American Journal of Engineering Education, 7(2). 84-96. Bai, H. (2015). Methodological considerations in implementing propensity score matching. In W. Pan & H. Bai (Eds. ), Propensity Score Analysis: Fundamentals and Developments. New York, NY: Guilford Publications, Inc.
Bai, H., Sivo, S., Pan, W., & Fan, X. (2015). Application of a new resampling method to SEM: A comparison of S-SMART with the bootstrap. International Journal of Research & Method in Education, 1-14. Bai, H., & Martin, S. (2015). Assessing the needs of training on inclusive education for public school administrators. International Journal of Inclusive Education, 1-15. Bai, H. (2013). A Bootstrap procedure of propensity score estimation. Journal of Experimental Education, 81(2), 157-177.